It's happened to the best of us: you really want a nice hefeweizen or maybe a good bitter, but all you have are room-temperature bottles. Short of waiting an hour or so or (god forbid) putting ice in it, how can a bottle or can of beer be effectively cooled quickly? Take a bucket. Or a bowl. Or a cooler. Or any other similar vessel. Put your beer bottles or cans (sealed! For the love of god, sealed!) at the bottom of the bucket. Fill it most of the way with ice. Then fill in with water until the bottles are submerged. Then throw in any remaining ice. Finally, add a volume of salt commensurate with the quantity of water, both solid and liquid, you've already got in there. Wait anywhere from 5 to 20 minutes depending on desired coldness and quantity of beer. 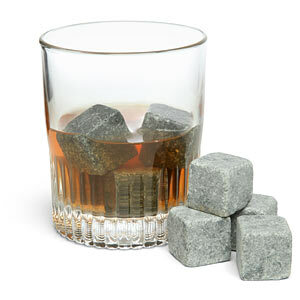 Another option might be some what less conservative, but instead of using ice cubes you could also use chilling rocks. This is also often used as an alternative for cooling whisky without diluting it. Soapstone is a non-porous, odorless and inert stone. It is tasteless and will not absorb odors from your freezer like ice cubes do. Soapstone has a high thermal mass, giving it the natural ability to retain its temperature for extended periods of time. If you are a bit more patient, you can just put the beer in the freezer for about 10 minutes. One method I know is to have large, heavy steins kept in the freezer. That way as soon as you bring beer, you can cool it by pouring into the stein. It won't cool your lukewarm beer to optimal temperature but it will give it a good few degrees drop. You can use "reusable ice cubes", which are essentially tiny plastic bags with water - that way you won't dilute your beer. There's also a stainless steel variety, it has slightly worse heat capacity but sinks to the bottom, which is less annoying than plastic bags floating in your stein. I read somewhere about making ice cubes from beer somewhere, so that they don't dilute your beer (you need a good freezer for that though). I can't vouch if they don't affect the taste though. edit: if you go with reusable ice cubes, use ones that contain water inside. Don't buy in to the scam of granite ice cubes or solid steel ice cubes. Their thermal capacity is abysmal. To provide the amount of temperature drop a single normal ice cube provides, you'd need to fill your glass with granite cubes to nearly the brim. At the Defcon security conference in Las Vegas, the Beverage Cooling Contraption Contest is an exciting outdoor event. Over the years, techniques have included adiabatic cooling (using a jet engine), dry ice, liquid nitrogen etc. In 2008, this team managed to cool a keg of beer from 80F to 33F in 35 seconds using air power, dry ice and alcohol. It takes a lot of time to cool a beer bottle in fridge. But it takes much less time if you put them in freezer. However, you shouldn't forget about such bottle, if you don't want the beer to freeze and explode the bottle. If it's not fast enough, take a few glasses, pour a bit beer into each and put them all into fridge. They will cool down much faster than the whole bottle, but the risk of making mess with broken glass is bigger, so it's better to check them each few minutes. One method I've used seen to good effect is to wrap the bottle in wet paper towels, and then put that in the freezer. Once the paper is frozen, the beer is quite cool, also the paper can be removed just by twisting it and it comes right off. Not the answer you're looking for? Browse other questions tagged temperature drinking or ask your own question. What means to adulterate and why is it so dangerous?